Reality Check: Are there 20,000 fewer police? "I do know my figures," she told the BBC's Daily Politics. She claimed that she had "repeated them correctly in six other interviews" before her appearance on LBC, and blamed the media for focusing on her gaffe, rather than the "real issue" of cuts to police numbers and increases in violent crime. Labour is promising to put 10,000 more police on the streets of England and Wales if it wins the election, to be paid for by reversing Conservative plans in the 2016 Budget for capital gains tax cuts. But the Conservatives said Labour had already committed the money they planned to raise from the capital gains tax changes to fund other pledges. Under Labour's plans, the 43 forces in England and Wales would get an additional 10,000 police officers over five years. It will not apply to Scotland or Northern Ireland where policing is devolved. 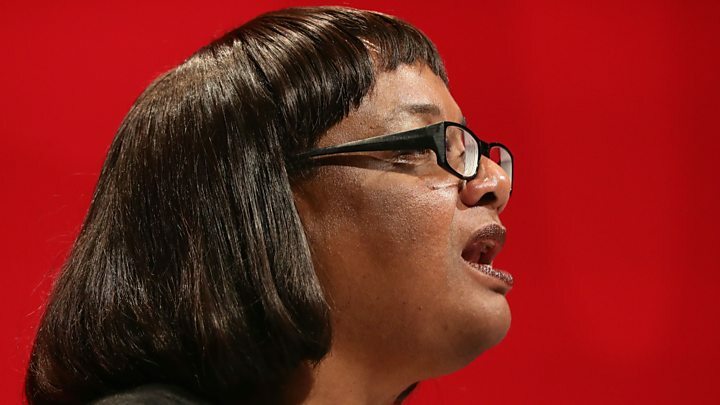 But Ms Abbott got mixed-up in an interview with LBC's Nick Ferrari as she was quizzed about the cost of the policy. Her estimate of the number of new recruits ranged from 25,000 to 250,000, while her first attempt to come up with a bill for the policy - £300,000 - meant each new officer would have cost £30 a year. Her second attempt left them costing about £8,000 a year. The BBC's assistant political editor Norman Smith said it was a "toe-curling" moment but there was a serious point - either Ms Abbott, who aspired to run the Home Office, had not done her homework on a key policy announcement, or Labour's numbers were a "bit flaky". 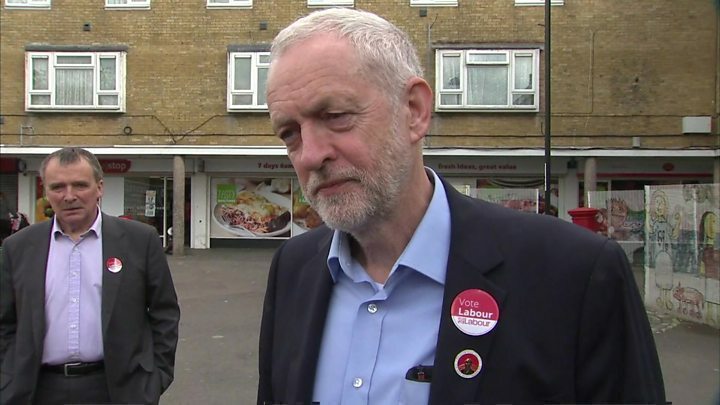 Asked on a campaign visit to Southampton if he was embarrassed by the gaffe, Mr Corbyn said: "Not at all, we've corrected the figure and it'll be absolutely clear now, today and in the manifesto. I'm not embarrassed in the slightest." He insisted Labour's plans for extra spending on police and other public services, to be funded by an estimated £2.7bn in savings from reversing capital gains tax cuts, were "fully costed". But the Conservatives said Ms Abbott had "floundered" when pressed over how the policy would be paid for and accused Labour of already pledging to spend the capital gains tax money on schools, welfare and the arts. 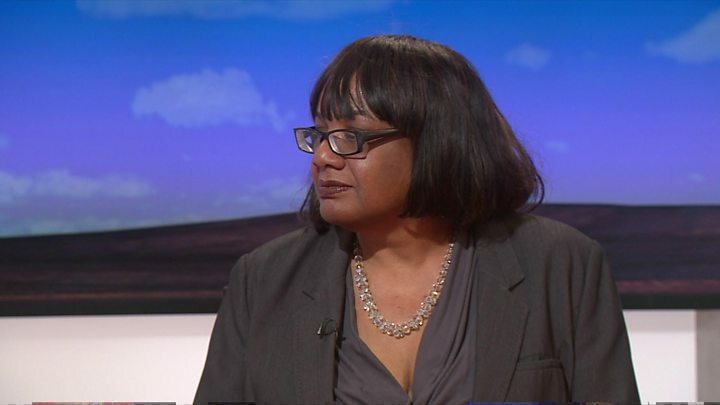 "Diane Abbott has laid bare the chaos that Britain would face if Jeremy Corbyn is voted into Downing Street," Home Secretary Amber Rudd said. "One of Corbyn's closest allies has clearly shown that Labour's sums don't add up, they would weaken our defences, and their nonsensical promises aren't worth the paper they are printed on." Jeremy Corbyn has said a 20,000 decrease in officer numbers under the Conservatives since 2010 was "unacceptable". "Community policing means uniformed officers being visible, local and accessible. They engage with the public, have a detailed local knowledge and build a network of relationships," he said. Ms Abbott told BBC Radio 4's Today they wanted an extra police officer to be put on the beat in every electoral ward in the country. "What local police forces are crying out for is more manpower," she added. "In the Metropolitan Police, although they have not cut police numbers, they have cut civilian staff and in practice that means there are fewer policemen available." "I think police forces are going to be very grateful for this extra manpower and it is going to be community policing." Capital gains tax, which is paid on the profit made from the sale of assets which have increased in value, was slashed in the 2016 budget. The higher rate was cut from 28% to 20%, while the basic rate was reduced from 18% rate to 10%. The Lib Dems said the figures being talked about by Labour were "fanciful". "They have already committed to spending the revenue raised from reversing Tory cuts to the capital gains tax many times over," shadow home affairs spokesman Lord Paddick said. "Under the Conservatives the police workforce has been reduced by almost 20%, this has eroded the community policing that we all rely on and left us all a little less safe, but what we need is concrete policy proposals."